1/8 Inch (3 mm) Genuine Suede Leather Lace Cord in 8 Yard Card. Made in U.S.A.
Bonnie Braid brand at the 4mm (.16" or 5/32nds inch) thickness, is a braided polypropylene cord, 100 yards (91.44 meters) length. This cord is most suitable for small to large macramé applications such as rugs, mats, plant hangers, purses, and wall hangings. We recommend using a Macarme Project Board for smaller knotting tasks. Similar to a Bulky (size 6) weight yarn, this cord can be used for home décor knitting and crochet projects; Similar to a medium or worsted weight yarn, this cord can be used for home décor knitting and crochet projects; use U.S. 11 or 8mm needles (for knitting,) or K/10.5 - N/13 or 6.5mm - 9mm hook for crochet projects. This cording is fusible (melt ends together with a lighter or melting tool). Fuse ends together to join ends or finish without making knots. This thickness can also be spliced together to form hidden knots. Made in the USA (except color Arctic Blue). 1/8 Inch (3 mm) Genuine Suede Leather Lace Cord in 25 Yard Spool. 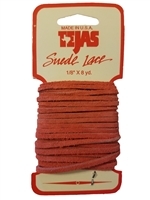 Made in U.S.A.
1/8 Inch (3 mm) Wide by 2 mm Thick Genuine Suede Leather Lace Cord in 100 Yard Spool. Made in India.